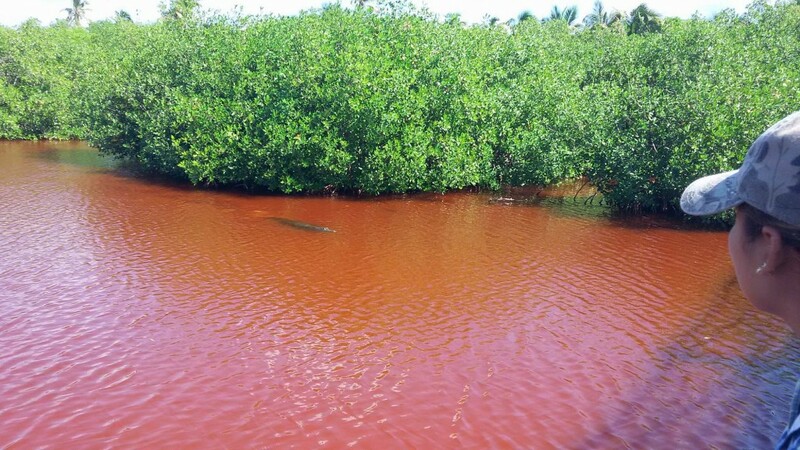 Press Release – American Crocodile Education Sanctuary (ACES) – December 4, 2015 – On December 1st thru the 3rd, 2015, four Belize Forest Department (BFD) Wildlife Officers, Edgar Correa, Minerva Gonzalez, Mercedes Valdez and Erwin Gillette, spent three days addressing wildlife concerns and laws in Ambergris Caye and Caye Caulker. The evening of Dec. 1st, the four Wildlife Officers, along with two police officers from the San Pedro Police Department joined the American Crocodile Education Sanctuary (ACES) on one of their evening crocodile research excursions. Belize’s Crocodile Expert and ACES’s Co-Founder, Vince Rose, and ACES’s crocodile conservationist Chris Summers shared pertinent crocodile biology and behavior facts with the enthusiastic officers. ACES has been humanely tagging crocodiles with Pro-ID microchips for an ongoing population distribution study since 2008. To date, over 500 crocodiles in Belize have been tagged providing pertinent scientific data and enabling the identification of problematic crocodiles for relocation, or captivity, to ensure human safety. 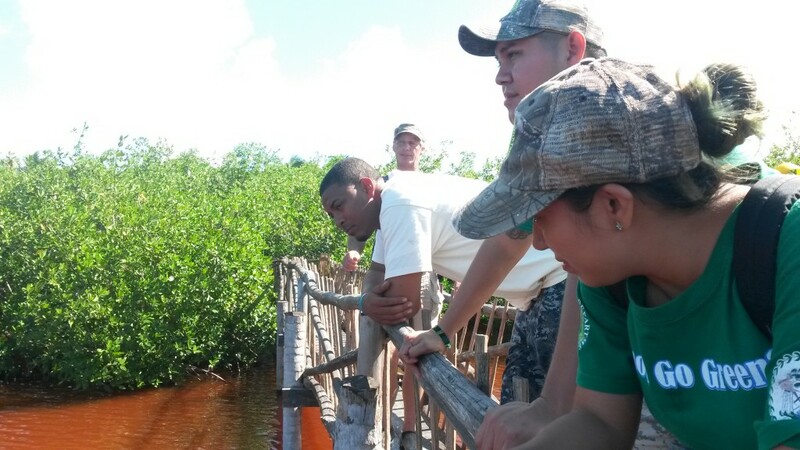 On December 2nd, the BFD and ACES visited the Estuary of Caye Caulker, a culture interpretive center with nature trails through a mangrove lagoon. 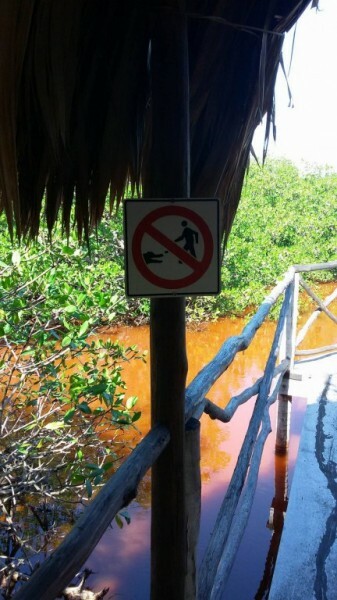 The BFD had received reports that there was possibly illegal crocodile feedings taking place. However, along the beautiful nature trail over the lagoon there were clearly signs warning the public against this activity. ACES looks forward to working with the Estuary at Caye Caulker and assisting in training their guides about Belize’s crocodiles under the direction of the Belize Forest Department. Finally, on Dec. 3rd the BFD held their annual “Green Law” training with the San Pedro Police Department and ACES. This included a power point presentation to refresh the police officers on Belize’s Wildlife Laws and the methods of enforcement for those laws, incorporating wildlife captivity laws and reiterating the fact that it is illegal to feed the crocodiles to protect the species, and more importantly humans. ACES and the BFD would like to thank Banana Beach Resort for donating accommodations to the BFD Officers for the two nights; Carts Belize for their donation of the use of golf cart for the BFD to check up on captive wildlife; and Gillian and Gordon Kirkwood for donating the funds for transportation to and from Ambergris Caye. Founded in 2006, the American Crocodile Education Sanctuary (ACES) is a non-profit organization committed to the conservation of Belize's critical wetland habitats and protected species, specifically Crocodilians, through scientific research and education in order to preserve Belize’s wildlife for future generations. ACES is currently Belize’s only government authorized crocodile conservation organization.